The AutoFold Pro is an automatic folding machine designed specifically for the professional digital or litho printer who has the need to fold precreased sheets. The AutoFold Pro can be aligned to any Morgana or other manufacturer’s creaser to give perfectly folded results on a wide range of both digitally or litho printed stocks. 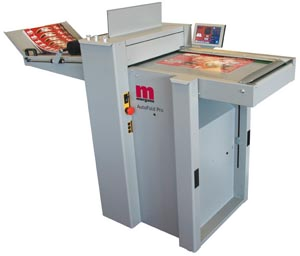 Controlled by the same innovative 7″ SmartScreen panel as other machines in the Pro range, the AutoFold Pro is instructed how long the pre-creased sheet is and which fold to produce. All settings and adjustments are made using the New SmartScreen and as only symbols are used, operation couldn’t be simpler. An alpha-numeric memory allows an unlimited number of jobs to be stored and named as you choose. This makes job recall much easier as you can use your own job names and numbers for storage. Thousands of printers have benefitted from installing a creaser to prevent cracking when folding digitally printed, heavy weight or cross-grained stocks. Folding was treated as a separate process and for many this was a manual task as traditional folding machines damaged the delicate surface of digital stocks. It is a free standing folding unit designed for folding digital stocks using our patented flying knife technology which was developed to prevent the scuffing and marking on digital stocks that are caused by folding using conventional methods. The AutoFold Pro is simply wheeled up to ANY manufacturer’s creaser and the height of its vacuum feed conveyor is adjusted to the exit height of the creaser. Both machines are turned on and the pre-creased sheets from the creaser are delivered directly onto the AutoFold Pro feed conveyor; here they are accurately registered to the side-lay before being folded as programmed and delivered onto a motor driven shingling delivery system which will ensure consistent, high quality stacking.